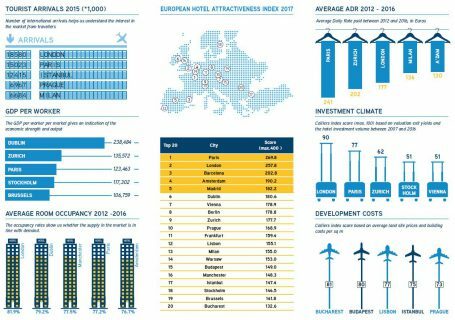 Paris claimed top spot in Colliers International’s Hotel Investment Attractiveness Index, an analysis of the investment climate of 20 European cities, despite predictions that investors and tourists would lose faith in the city due to political uncertainty and the perceived threat following various national security breaches. Prague was ranked in 10th place in the index, boosted by the low level of development costs and high number of tourist arrivals. Paris’ lead ranking was down to its high demand growth, strong hotel performance, high investment returns and market depth from 2012-2016. Prague scored highly on two metric components: it ranked 4th out of 20 cities on the tourist arrivals component with 6.97 million international visitors in 2015, and in 5th place for development costs based on average land site prices and building costs per square metre. London and Barcelona were the 2nd and 3rd most interesting cities to invest in, closely followed by Amsterdam and Berlin. The story for the top two cities, London and Paris, is very similar, but Paris pipped London to the top spot by virtue of having slightly lower development costs. Low development costs is one of the areas in which Barcelona excels, increasing the overall attractiveness of the city ahead of Amsterdam, which was in 4th place. In all other areas, these two cities have very similar performance ratings. At the other end of the scale, although Bucharest scored very highly for the development cost component, it was not enough to compensate for low demand appetite and the lack of a hotel investment market, so it was ranked bottom in 20th spot. Istanbul was ranked relatively lowly at 17th, despite the size of the market helping to drive a good overall demand score and low development costs. However, the operational performance lagged behind due to low occupancy rates, leading to lower returns on investment. The current political and economic climate is not particularly conducive to a robust investment market. Zürich is an interesting one to watch out for, as its operational performance has been excellent over the last few years, suggesting an under-supply of quality hotel stock. Hotel investment interest is high, and if demand for the city continues to increase, it may become one of the most popular cities for new development and investment, despite the high development costs. Manchester and Dublin also performed highly, where hotel performance exceeds demand. The case for an increase in business demand growth in both cities looks very strong in the coming years, which should increase their attractiveness to developers and investors alike.